An uncontested divorce is a divorce where the parties are capable of discussing their differences before-hand and coming to mutually acceptable agreements in respect of all issues between them. Once this type of consensus is reached, the parties no longer have any issues which need to be fought about in Court. These types of divorces are known as uncontested divorces because it is unnecessary for the party being sued for divorce (defendant) to defend the action because the outcome desired by the party suing for divorce (plaintiff) is mirrored by the party being sued. What kind of issues are agreed upon between the parties in an uncontested divorce? A marriage is usually a very complex relationship. It therefore follows that there are often many things for the parties to discuss and try to deal with in an uncontested divorce. We will assist you to identify all the relevant issues which may be involved in the divorce. What is the process involved in an uncontested divorce? The parties discuss and reach consensus on the issues pending between them. The agreement between the parties is reduced to a Settlement Agreement and is signed by both parties. Summons is drafted and the Settlement Agreement is attached to the Summons. Summons is issued at Court and served on the Defendant. The Summons and Settlement Agreement are served on the Family Advocate. The Family Advocate considers the Settlement Agreement and indicates whether same is in the best interests of the minor children. The matter is set down for hearing and the Plaintiff testifies in Court as to the relief claimed in the Summons. If the Court is satisfied a Decree of Divorce is granted. Can one firm represent me and my spouse? From the date of signature of the Deed of Settlement, the divorce usually takes 6 – 8 weeks to finalize. It can be quicker or slower, depending on the performance of the Registrar of the Court, the Sheriff and the Office of the Family Advocate. 6 – 8 weeks is the usual time-frame. What is the cost of an uncontested divorce? 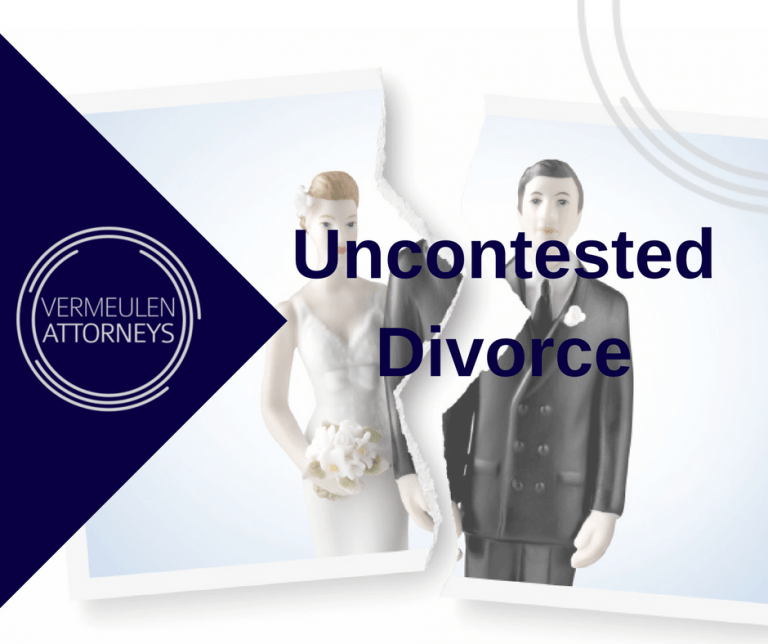 At Vermeulen Attorneys we charge R 9500 for an uncontested divorce, from start to finish. The only additional cost is the Sheriff, which is usually between R 100 – R 300. A deposit of R 4500 is billed on first consultation for the consultation and preparation of the Settlement Agreement. R 2500 is billed when the Summons is prepared. A final amount of R 2500 is billed for the appearance at the High Court. What issues will be dealt with in the divorce? In divorce matters the issues dealt with are usually: 1. Division of Assets and Liabilities; 2. Rights and Responsibilities in respect of children; 3. Maintenance for the parties. Though our payment terms entail that payment is due upon presentation of an invoice, we realize that legal costs are often an expense not budgeted for. For this reason, we accommodate clients as follows: 1. We accept credit card payments at our offices, and online via Payfast.co.za; 2. In some instances, payment arrangements may be negotiated, subject to credit checks being done, and monthly payments being made by direct debit order. Divorce matters are finalized at Court as soon as final payment has been received.